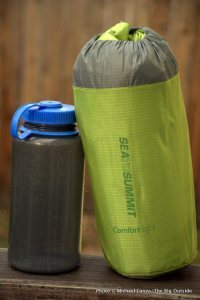 This sea to summit comfort light insulated review will give you the information you need to try out what I believe, through experience, is one of the best insulated backpacking mattresses on the market! I love hiking and lighter is better for me. When I go on vacation for a week I take one carryon with me, nothing more. That’s probably because when you hike long distances like me, the lighter the better. The Sea to Summit Comfort Light Insulated Mattress is the lightest mattress I’ve found that satisfies my sleeping needs when I’m out on the trails; when you’re dead tired and just looking for a good sleep. This neat and discreet air mattress is perfect to rest my weary bones after a nice 15 mile hike; which is the norm for me on my hiking adventures. I was excited, though a bit skeptical, to do this sea to summit comfort light insulated review. The reason being I LOVE to sleep, hahah. I had heard good things about this mattress but it seemed almost too good. But I’m happy to say that all the positive things I heard were bang on. The Summit Comfort Mattress weighs next to nothing and packs easily down to the size of a small water bottle. I love the convenience! For its thickness, two and a half inches, it’s the softest and most supportive air mattress on the market. Inside you’ll find a matrix of 324 small and almost 400 large air cells that shift in a balanced fashion to ensure consistent comfort; even if you’re a little heavier; the support is excellent. It’s designed for full support. This means you aren’t going to get flat spots or wake up with your hip bone sticking into the rock hard ground while your shoulder floats unevenly on air. Dual-layer construction is used with hybrid design to ensure maximum comfort with quality insulation, and still maintain the ultra-light design. The insulation is thermolite synthetic with an R-value of 4.2, this stamp of approval means it’s recommended for all 3 seasons of outdoor backpacking adventure. In creating this sea to comfort light insulated mattress review, I found the mattress versatile, light and functional; making it a top pick for backpacking. Sea to Summit Comfort Light air mat stuffed. I love the fact that the Sea to Summit Comfort Mattress is easy to deflate with its two, one-way valves. I blow it up in minutes manually but you can also get the job done with a Jet Stream Pump Sack or Sea to Summit Air Stream Dry Sack; this is a 35 liter, seam-sealed, dry bag roll-top. You just fill the backpacking mattress by simply blowing a big breath into the sack, adhere it to the inflate attachment, and squish the sack to force the air into your mattress. Repeat the process a couple of times to get your Sea to Summit Mattress inflated. I want to tell you about another key factor in this sea to summit comfort light insulated review; the outer shell of the mattress is top quality and designed with a 40-denier TPU laminated nylon, the same material other high-end backpacking mattresses use. I will say I love my bed at home best, but when I’m out in the wilderness I stand firm (and sleep well, haha) by my sea to summit comfort light insulated review. Get the Sea to Summit Comfort Light Insulated mattress – so the next sleep you get will be heavenly!